Scottish racing driver Gregor Fisken ended his season in style last weekend with a memorable class victory in the 1000 Milhas at Interlagos, a win he described as his ‘biggest result ever’. 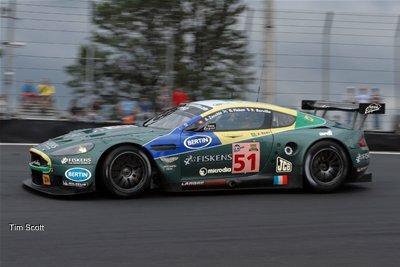 Fisken joined co-drivers Steve Zacchia, Roland Berville and the Brazilian Fernando Rees at the wheel of Larbre Competition’s Aston Martin DBR9 for the final round of the Le Mans Series season, with a faultless display from both team and drivers securing sixth place overall and a class-winning margin of nine laps over the Corvette C6.R of championship runners up Luc Alphand Adventures. 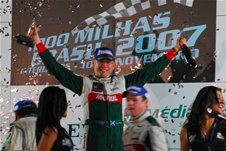 Having also tasted the victory champagne at the Silverstone 24 Hours in September, Fisken admitted that his second major win of 2007 was the sweetest of moment of his career so far. "I think this was my best result ever," said Fisken after the 1000 mile, 10 hour race, "The Mil Milhas is a world famous event and to fight with the best cars from the Le Mans Series and beat the Corvette for the class victory is fantastic. I have to say that this feels like the high point of my career thus far." After a sterling, error-free display from all four drivers, Fisken heaped praise on his team mates. "Roland didn’t make a single mistake all weekend, even at night when conditions were very difficult due to the lack of lighting. Steve was, once again, superb. He was running similar times to all the professional works drivers in the Corvette and did a brilliant job during his two night-time stints. As for Fernando, well I thought he was an absolute revelation. He had never driven a GT1 car before or driven such long hard stints, but still did a great job. His times were very close to Steve’s and I thought that was a remarkable achievement, considering he’s had so long out injured after breaking his back in his massive F3000 accident last year." Despite the team’s healthy nine-lap winning margin, Fisken revealed just how hard the race had actually been. "It was a tough race with very long stints. The Corvette never gave up the chase, making it a proper race from start to finish, so the feeling when we crossed the finish line was just fantastic. "The car felt extremely good all weekend. Jack Leconte and his team also ran a very good strategy and were first class at every pit stop. This result is for the team and for Aston Martin." Le Mans Series -- Race 1000 Miles General Result at 21.27 - last normal timing av. The ACO gives a warm welcome to the birth of the "Groupe Pescarolo Automobiles"